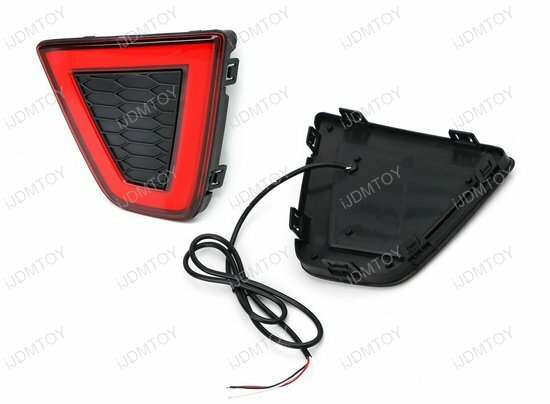 Q: What car will this LED bumper reflector lights fit in? 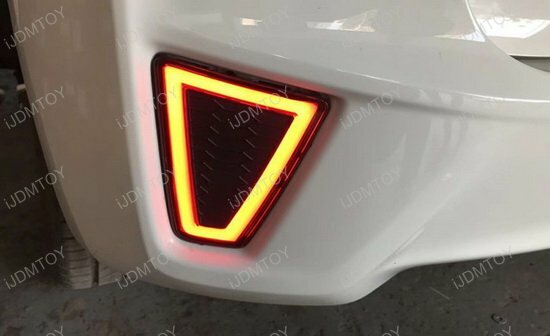 A: The JDM fluid style red lens LED bumper reflector tail & brake lights are made to fit in the Pre-LCI 2015-2017 Honda Fit. Q: This is just a light where my bumper reflectors are set? 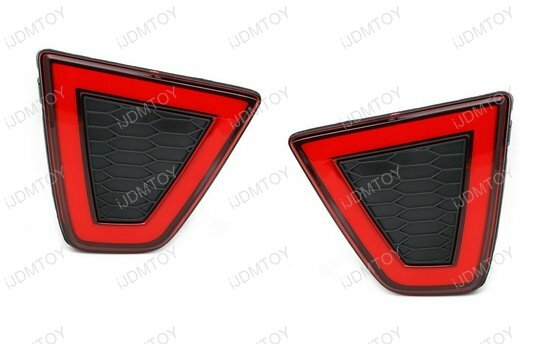 What else do these LED bumper reflectors do? 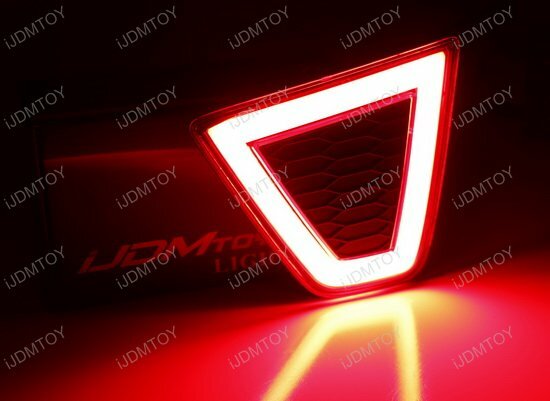 A: Aside from being a bright tail light, the LED bumper reflector light assembly also functions as a powerful brake light that shines brighter when you apply your brakes. 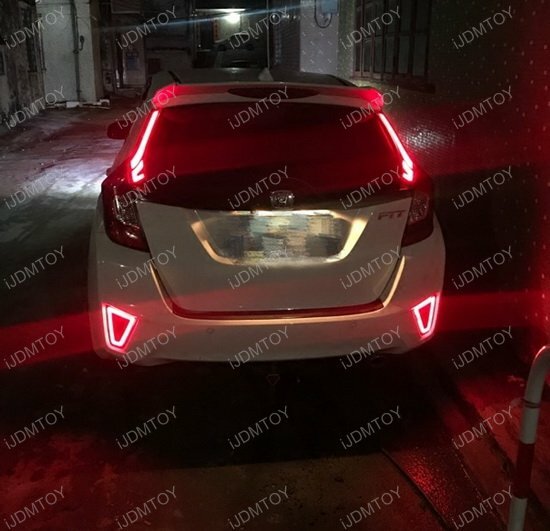 Q: After the installation, why do the LED bumper reflectors not light up or the bright/dim modes are reversed? A: There are three wires (1-ground 2-bright mode for brake light 3-dim mode for tail light), please make sure they are connected correctly to the vehicle's ground, and rear tail lamp's brake light wire and tail light wire. Otherwise, you might experience issues like this not lighting up or the bright/dim modes are reversed. Q: What is fluid style? A: This LED bumper reflector fog light set has a fluid style appearance, meaning the LED chips don't shine individually but instead emits through a shroud so that it appears as if it's one solid LED bar. This achieves less of a rugged truck-like look and more of a JDM or a Ford Mustang style. Your Honda Fit is a unique hatchback on the road. While it gives you the bare essentials, its drive is noticeably stronger than compact cars like its cousin the Civic LX. The Honda Fit has one of the more distinctive tail light designs that stand out in recent years. They appear sleek, edgy, and trendy. Such design can be boosted by adding a fluid style LED rear fog light assembly! 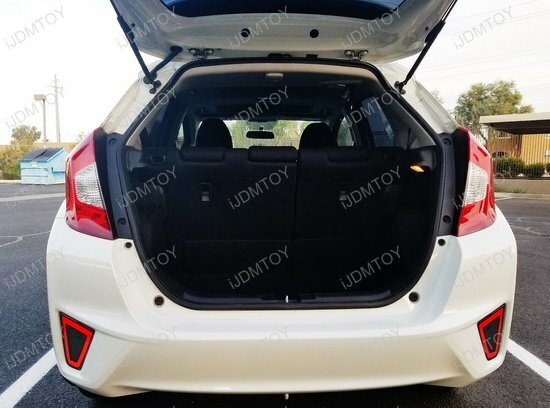 This page features the JDM fluid style red lens LED rear fog/bumper reflector/brake light set made to fit the 2015-2017 Honda Fit (pre-LCI). 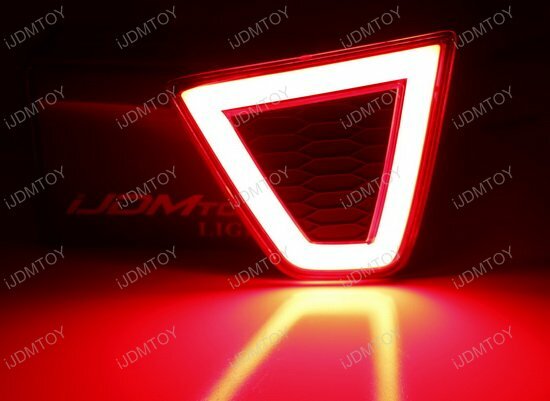 Each rear LED lamp is powered by high powered brilliant red LED emitters that are masked by a tube-like lens, which create a fluid appearance that most luxury cars' tail lamps enjoy. Easily replace your stock bumper panels with an LED lamp assembly that acts as bumper reflectors and lights up as a running fog light and brake light. With the JDM fluid style LED rear fog lamp assembly, your Honda Fit will achieve a sportier tail end look that complements your tail lights!